Please, write an e-mail to get this software. The software Gauge Control processes data from MIKON-157 and MIKON-227 devices (wel and manifold manometers). Gauge Control starts measurement, edits control programs, transfers data to PC, show graphic and additional information. Three levels of control programs creation. The easiest one is choosing from list of presets. The mid-level is programming by blocks or intervals. The expert level allows to create adaptive programs that can control environment and decide whether to save info or drop it. 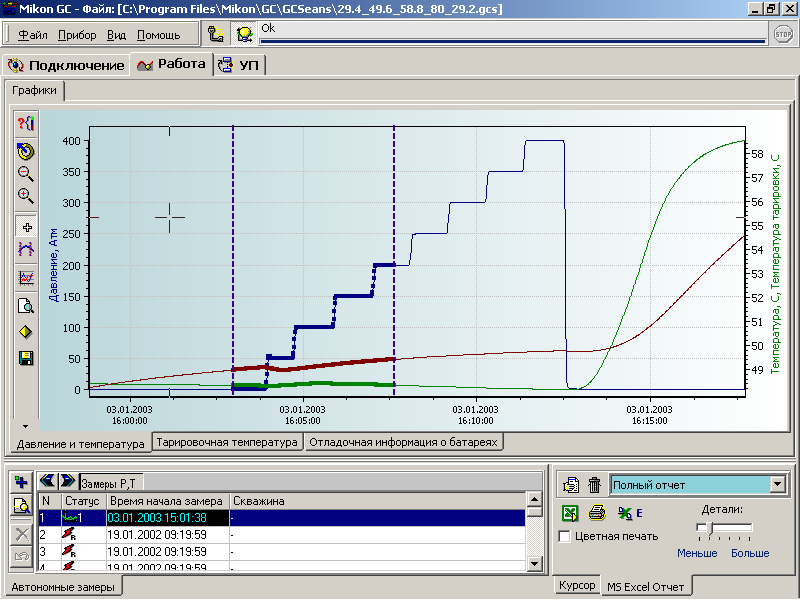 Prerun testing of control program (on PC) for statistic analysis of future measurement. Temperature compensation with cubic spline interpolation on 3D surface. Out of calibrated range pressure and temperature forecast. Preprocessing filters: smooth, average, rediscrete. Cubic spline transform for increasing points. Allows to draw a graph in skipped or mismeasured range. Overlay graphs, registered by some manometers. Joining graphs from different manometers. Direct measure (draws graphs in realtime). Graphs print (black&while and color).